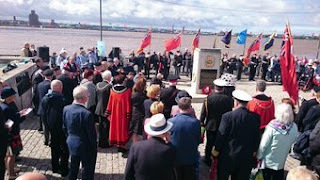 On Sunday I attended the Merchant Navy Day Service at Liverpool Parish Church- the seafarers' church. Before the service there was music from the Port Sunlight Seadogs whose shanty singing was a feature of the celebration of the Liverpool Pilots being awarded the Freedom of the City. 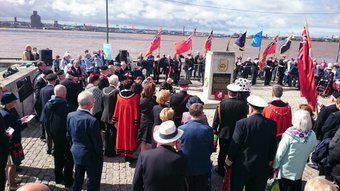 After the Church Service we processed to the Pier Head to for the laying of wreaths on the Merchant Navy Memorial in memory of the 36,000 seafarers who lost their lives in conflicts.